Welcome to Little Alligator! All of the items you see in my store have already been created and are ready to post within 2 business days. I've decided to discontinue the much loved personalisation tags, however I hope that you and your children will still love and cherish your special fabric bag handmade with love. Library bags, toy bags, wet bags and pouches - handmade, modern & versatile storage options that are stylish for adults and fun for kids. Charming and made to last, we have irresistible creations to help you organise your family. Library Bag. Retro Rockets & Robots. Drawstring School & Kindy Bag. Book Bag. Large Ballet Bag. 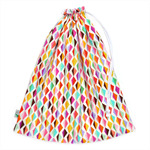 Drawstring Bag. Cream Pink & Grey. Ballet Slippers Dancewear. LAST ONE! Flamingo Library Bag or Book Bag. Gorgeous Pink and Grey Fabric. 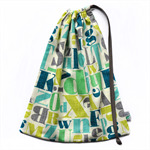 Large Drawstring Library Bag. Perfect for Kindy or School. Blue, Grey Alphabet. Small Waterproof Swim Bag for the Pool / Beach. Fish Wet Bag or Bikini Bag.